FUTURE GOAL: "Successful college career, play at highest level I can, successful career in sports' broadcasting." Cooper senior Lexi Held has been starting varsity basketball since the 8th grade and already has scored more than 2,000 points in her impressive career. Lexi holds nearly 20 career, single-game and single-season school records, including points, assists, steals, blocks and more. She has had many big games this season, including scoring a single-game school-record 43 points vs. Ashland Blazer. Other big games this season include vs. Boone County (41 points), Notre Dame Academy (36), Holy Cross (34), Ryle (30) and Nelson County (30, to go over 2,000 points for her career). Her junior year, she helped lead the Lady Jaguars to a 22-8 record and a district and regional runner-up finish. 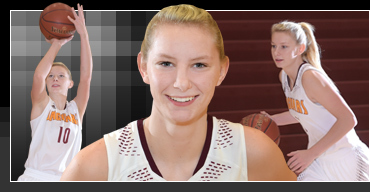 She averaged 17.7 points-5.2 rebounds per game and tied for third in the state in free throw percentage at 87.3%. Lexi last season earned numerous awards, including being named NKAC Div. I Player of the Year (Coaches), NKY Co-Player of the Year (Greater Cincinnati Basketball Hall of Fame), 9th Region Player of the Year and 1st team all-NKY (Enquirer). Additionally, she was named to the district and regional all-tournament teams. Lexi, who also competed in track & field for four years for the Lady Jags, is a great student who is active in community service and will play basketball collegiately at DePaul University. Her favorite athlete is Steph Curry, favorite entertainer is Kevin Hart, favorite book is The Circle, favorite movie is Bridesmaids and most-like-to-meet is Diana Taurasi. COACH'S QUOTE – "One of things that makes Lexi so special when comparing her to other players in the area is that she plays both end of the court. She is a very good defender in addition to being a scorer. She knows the game and has the ability to see things developing before they happen."